Neverending Journey to Eldritch Horror! The dark, creepy stories, the unfathomable. Cosmic Horror, with all tentacles, twirling appendages and eyes on portruding stalks I can handle. I always loved Lovecraft works and the genre in general, and to delve into the grotesque and mad in form of creatues, beings and alien worlds, that are far away from being nice and tranquil is what I aim for. To reach my goal for this year I want to draw 52 proper colored illustrations of iconic beings from the genre and clasp them together with very short stories and tidbits into a most likely self-published Atlas - the Monstronomicon. Of course beside the 52 I'll pick and work on I'll post plenty of sketches and other things related to this theme, as I need to practice them a lot before I feel comfy in tackling the big ones for the book. A Great Old One based on the monstrous creature of the same name in the Celtic mythology is an underwater horror that is part fish, part whale, part octopus and wholly unholy in its grotesque form. This lurker in the dark depths will lure the ships with the strange echoes and cries only to crush the vessel within its tentacles and draw it to the vast, oceanic abyss. Was kind of afraid of this one, considering that I changed a lot since the first sketches I did in the silhouette and frankly, it was not looking too good. Still, decided to push through and hoped that proper shading will make the certain aspects of the beast to pop, and Lo and Behold! It did. I'm glad I didn't scrap this piece and finished it instead, was quite a process to shade the darkest areas with watercolors, because watercolors are excessively ruthless. Ultimately, it turned out pretty okay, and it is another neat step in filling up my watercolors sketchbook. That's all for now, but new stuff should arrive fairly often I'll be happy for every bit of feedback, comments and just general talky-talk as well! This ancient Great Old One is a solemn entity, inhabiting a distant desert planet, where shifting sands cover the ruins if vast civilizations and enormous amounts of statues of various beings in different states of joy and elation. Utagra was surely a god to these mortal species as monuments of his likeness still peek from under the sands. None the less all who praised his name met their strange demise, as the artistic deity sapped their will of life and happiness to create a glassy, yellowish substance which he used to create his art, while slowly driving its followers to bleak apathy and stagnant depression. Glad to see you back on the forum! Love your stuff--your Inktober was my favorite!! @Marsha-Kay-Ottum-Owen Thank you most kindly. I know they are not very, hm, child-friendly, but I have a 11 years old brother, and despite the young age he really digs the creepy monsters. Little is known about this Great Old One. The title itself betray its origin, a spawn of the Demon Sultan itself, the blue and grey shapeless horror with malformed and misshapen head, with body full of holes, its form oozing some viscous slime. It was called an End of Mankind, but its ploy and purpose is shrouded in a thick veil of mystery. And those who lay their gaze at its form goes surely mad, and so any description we have are a jumbled mess of destroyed sanities. @hubertspala Well, my son is 23 years old He is also an artist and when he was young always drew creatures I'll have to show him yours. @marsha-kay-ottum-owen I showed your creatures to my son. He said the line work and coloring remind him a lot of Bill Watterson. He was wondering if he has been an influence on your work at any point. (He likes them by the way ). The time has finally arrived for me to put action into reality, to proverbially put the money where my mouth is, and start working well and hard on the Mythos Monstronomicon atlas project. Just in case that you read about it for the first time, it is a personal project of mine that I’d wish to finish this year. Why? Because I really want to have something done entirely by me. To prove myself that I can deliver, to check how productive and tenacious I can be. For what? Because drawing monsters, aliens and twisted, grotesque beings is what I love and what brings me plenty of joy. And of course I’ve got inspired by a great book I read last year and decided to make one of my own, with my spin and theme I enjoy! So, enough introduction, time to get to the core of my work. Below I present to you my very first page spread layout prototype with actual story bits (without any editor looking through it, nor correction of any sort – literally first draft at the idea). Let’s break it down then. Of course on top we get the name of our being paired with its number in the Atlas and the title that most of such being is given. Below there are two informational brackets. ORIGIN is all about our real life anchor of the being first appearance and its author. DATA: Display the being category (Outer God, Mythological God, Great Old One, Unknown, Elemental Force etc.) and the location in which the being is lastly known to be found at. Below the line there are tiny flash stories divided into points that might or might not build a cohesive narration, as they are just journal notes of our explorative and curious expeditioner into the unknown realities, beyond our vision. Here you’ll find little folk tales about the creatures, statements of the broken people who claim to encounter them, other evidence or flimsy proof of their existence and so on. 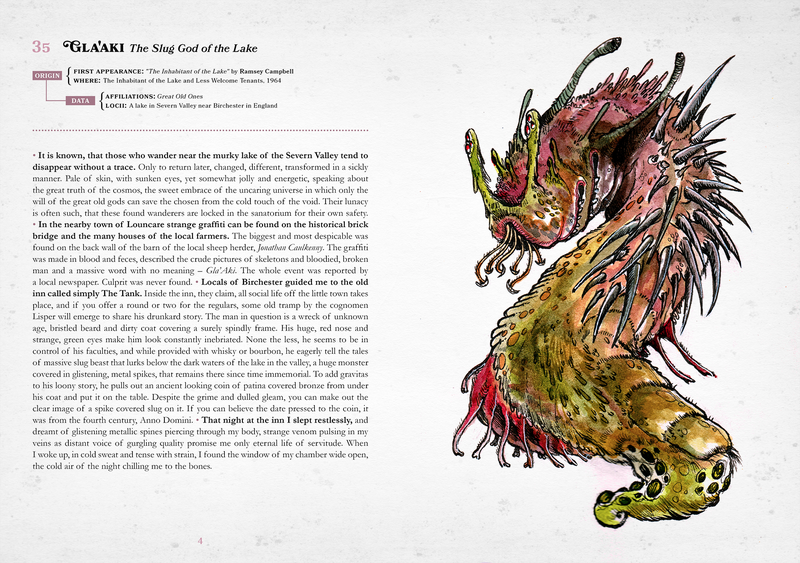 And of course on the right side of the spread there will be the illustration (all traditional art, Inks and Watercolours) of our glorious entity in its imagined visual description. Is the layout clean and have good readability? Do you think a textured background is fine? Is there any bit of information you’d like to be added to the info about the being? In what order the 52 beings should be filed? Alphabetically? By order of power in the lore? Other? Should I perhaps make a separate blog / FB page about the project, so it’s easy for the interested people to track the progress, communicate their wishes and give ongoing feedback? This looks really cool! I love the idea and the art is great. 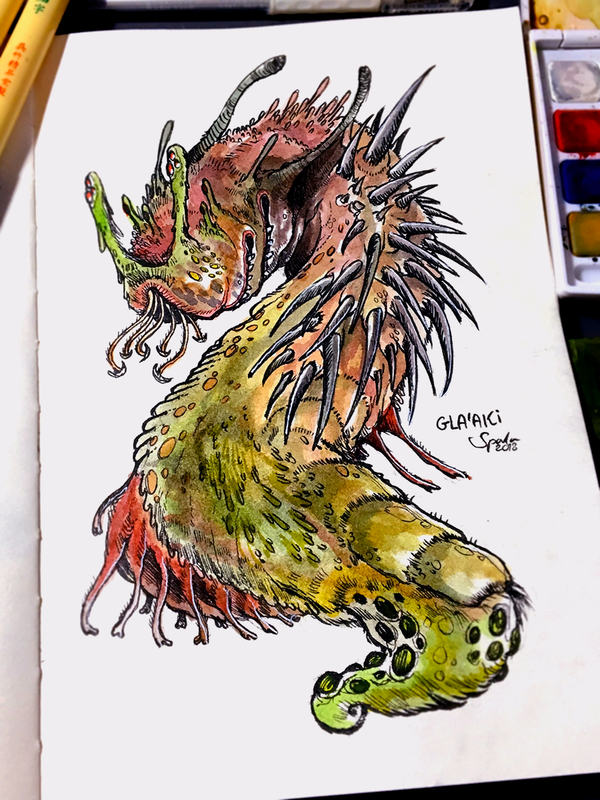 Some personal feedback: I would add some drop shadow to the monster or find a way for it not being "floating" on the page (Like you did on Ghadamon). I would also love to see some extra info/classification on the bottom of the text page. You could come up with some colors or tags for order of power, creature class, enviroment, rarity, threat level, population, etc. These are just examples, but you could surely figure out some extra info that fits the lore. Check the wikipedia to see how they classify animal species, it might give you some ideas. Overall it looks like a great project. Can't wait to see more, keep it up! Orgosmhurs are strange beings that resides on the peaks of the Sea if Cains many hills. Each hill a grave to some ancient king or warrior of valor might now be more than a place for ghouls and ghasts, but a home to this wanderers from the different plane, sitting unmoved upon the hilltop, strange, sweet scented mist surrounding them, as well as a curious sensation of a distant whispering. Despite their grotesque forms, they seem lulled and calm, never harassing the brave adventurers who dare to cross the vast graveyard... That is, until some misbegotten soul raise a weapon against it. It might be true, it might be not, for if anyone indeed tried to attack the otherworldly beings, none claimed it to be so. Perhaps because no one survived such an attempt. Or perhaps no one tried. Yet.